NOTES : French version by Del Distribution. Inlay is in French on this version. The manual translates the English sentences of the program - with an obvious mistake, as some messages from the Hunchback game are translated ! Takes me back to warm summer evenings in 1983, in my hometown of Withernsea, playing on a big boxy 26" ex-rental TV that dad got me for getting through my O Levels... little did he know I spent most of my school exam revision time PLAYING this superb arcade conversion most nights - LOL! Brilliant coding/gameplay - hats off to Ocean. Absolutely loved this game, I still play it today (30 years later). 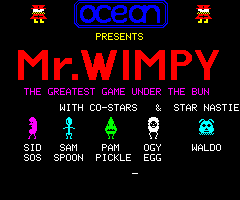 In my opinion, this version is the best of the Mr Wimpy's that came out. 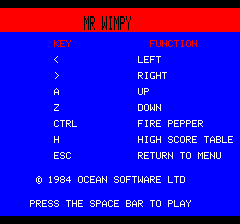 The C64 and Spectrum versions seemed like poor imitations of this one. Very funny game, very addictive, and very very nice ! Still fun and addictive after all the years. that was a kewl platformer, luckily it was quite slow because with four monsters after you it can get a bit frantic: It's all in the pepper management! Recently i discovered the original burger time on mame but this will always be the game that introduced me to british "greasy spoon" culture! This game is really smooth and interesting. 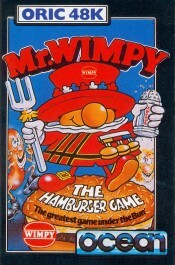 Mr Wimpy is a good game, but I find it rather repetitive once you've played 2 or 3 levels. But as Lothlin says, that's the kind of game you keep coming back to ! Very good game This game in our family played so frequently, and the tape with file was damaged It isn't basic game, and I can't make a copy, becouse of copy program absence, as copy-copy for Spectrum, for example. Now I am happy to play it many years ago. The thing i didn't like about this game, was collecting the ingredents, this was at time very frustrating, and pointless. when you got to making the burgers however, there was as far as iremmember a bug where you could stand in an area and not get caught. Played the game over and over again, loved it. The arcade machine "Burger Time" was one of my favourites and this rendition of it is very good. Movement is smooth and the game plays well. 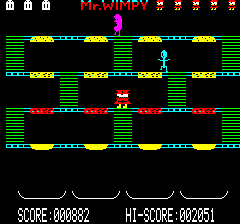 This is one of the games I keep going back to, along with Manic Miner, Tyrann and Pulsoids! That game is very nice. That's one of the few games published by Ocean on the Oric, and that one rules. First, the graphics are really top notch. Then, the gameplay is quite interesting and challenging. Before making burgers, you have to collect ingredients... really a nice one.